NCAIR 2019: “Treasure” Found in Every Presentation! 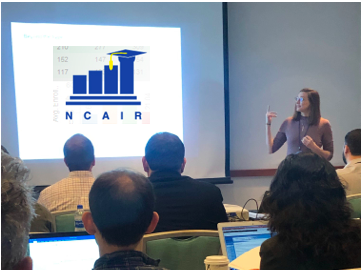 Last week, representatives from more than 40 institutions across North Carolina convened at Wrightsville Beach for the annual NCAIR conference. Located in a beach town near waters once frequented by the infamous privateer Blackbeard, this year’s event was piratically titled “Finding Your Treasure." Directors, researchers, and analysts discussed how they discover hidden gems and insights among the sometimes-overwhelming amounts of institutional data.